Chennai barber's new hair-cutting technique―set it on fire! A barber in the city of Chennai has come up with a new way to make it big on social media and boost his customer base―setting customers' hair on fire instead of trimming their hair with scissors, footage filmed on Monday reveals. 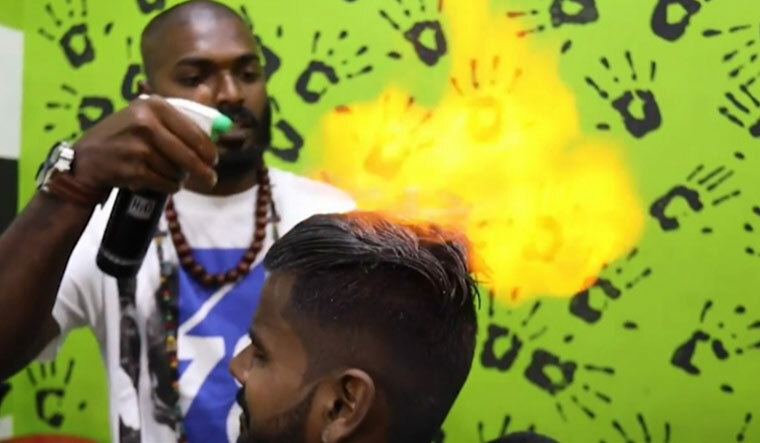 The technique is offered at Pitaco Barber Shop, where Karthick covers his customers' head with flammable powder and liquid before setting it on fire with a lighter. He then uses two different combs to style the hair while it is still alight. He says the technique is not dangerous. Karthick says the fire haircut became popular on social media, with an increasing demand of customers at his shop. “Normally on average we get 60 per cent of work in a day, but after the fire haircut we are having 100 per cent work and there are always customers,” he explained.